Will a bank give me a loan for a foreclosed home? Are foreclosed homes in livable condition? Will a real estate agent help me buy a foreclosed home? What exactly counts a foreclosure? These questions and more could all be running through your head, and the sheer weight of finding the right answers could hold you back from finding the foreclosed home of your dreams at a price that’s better than market value. So in this simple guide to buying foreclosure property, we want to set the record straight and give you the answers you need. Simply put, a foreclosure home is a piece of real estate owned by the bank after the previous owner fell behind on payments. All sorts of situations can lead to this (such as job loss or unforeseen expenses), but the common factor is that when you are buying a foreclosure home, you are buying from a bank, not another homeowner. Often, a foreclosed home is selling for less than its market value. Generally, this is because the bank is not in the business of owning real estate and is mostly looking to make back the money they lost on the loan. For example, imagine that the previous owner took out a $300,000 loan to buy a $350,000 house. Want to see all of the foreclosed homes for sale in Boston? Click Here! The bank forecloses on the property after the owner still has $250,000 to pay back on the principle of the loan. If the bank lists that house at $250,000 to just make back what they’ve lost on the loan, then buyers could score a new home for about 30% less than the market value. So, you know what a foreclosure is and understand why they might be worth your time: significant savings. But, there are still some important considerations to keep in mind when deciding if buying a foreclosure is right for you. As we mentioned before, banks aren’t in the real estate business. They aren’t homeowners looking to get the most possible out of a sale so that they can put the proceeds towards a down payment on the next house. Generally, they are just looking for as simple of a sale as possible to make back their losses with minimal effort. For this reason, most foreclosure sales are made “as-is”. You’re buying a home with all its quirks and defects, and you usually won’t have the bargaining leverage to ask the seller to make repairs. Since you are buying the home as-is, you’ve got to be prepared for a house in less than perfect shape. However, not all foreclosures are fixer uppers, despite their bad reputation. Think of it this way: the foreclosed property has probably been listed for sale without being prepared for sale. It might not be move-in ready, or the paint job may need a touch up, for instance. What’s important to consider is whether or not the cost and time of repairs are worth the savings you are getting on the home compared to others. For example, if you’re paying $250,000 for a foreclosed property that requires $50,000 in work, it may only be worth your while if the market value of the house is higher than $300,000. How you buy a foreclosure home varies depending on the status of the home. When a house is first foreclosed, it will go to auction (known as a trustee sale). You can bid here, as at any auction, but be prepared to pay immediately with a cashier’s check or the equivalent. In many instaces, the bank will hire a top local Realtor to list the home. You’ll need to have all your homework done before hand on things like liens and taxes owed. If no buyers bid on a home at the trustee sale, the bank will officially take possession of the home and it will become known as an REO (or real estate owned property). Typically, when you see a home classified as a foreclosure on a real estate listing, it is actually an REO. Buying an REO property is very similar to buying any other property. You’ll want to take all the usual steps, such as getting your financing in order, searching for forclosures for sale online, having an appraisal done and getting the property inspected. But be prepared for a few additional challenges as well. For starters, banks can be slow to deal with and hear back from. Additionally, you often won’t have much wiggle room on negotiating price on an REO. Also when you are searching for foreclosures for sale, think about the financing. Depending on the condition of the home, obtaining a mortgage isn’t always as easy as it is with regular property. As a general rule, most mortgages are designed for homeowners to move into the property. If the home must be repaired first, it may be considered an investment. This doesn’t mean you won’t find a loan; it just means you should speak with your lender about the options. 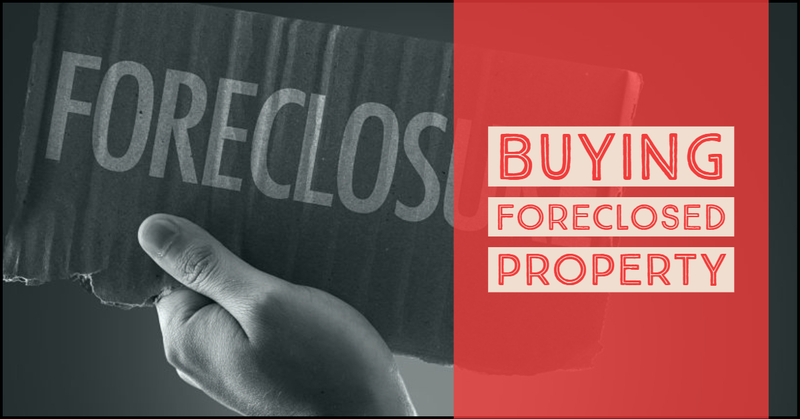 A foreclosure can be a very smart investment opportunity, and an ideal opportunity to buy more home than you might otherwise be able to afford. But you need to do your homework and buy the right foreclosure the right way. Enlisting the aid of a professional real estate agent who has dealt with foreclosed homes before is one of the surest ways to set yourself up for success. Talk to an agent who understands the process.